At 17, Hawthorn Creely is only four years younger than Lizzie Lovett, a local woman who has gone missing from a nearby campsite. Hawthorn, still holding a grudge after being dismissed by Lizzie years earlier, becomes fixated on the older girl's life since high school. Under the guise of investigating her paranormal theory behind Lizzie's disappearance, Hawthorn befriends Lizzie's boyfriend, begins waitressing at the diner where she worked, and visits places Lizzie frequented. But Hawthorn's true motivation often seems to meander from the missing woman: "Maybe, if I showed the world that werewolves existed, people would stop asking me about my plans for the future. No one would care about the future, because I would have already proven myself, accomplished something great." Hawthorn is self-involved, shortsighted, and often selfish, but Sedoti deftly pulls readers into her head where her yearning for excitement, angst about the future, and insecurity bring further depth to her character. Hawthorn and Lizzie both emerge as surprising, intricate characters whose stories are resonant and memorable. Ages 14 up. I was provided an ARC of this book in exchange for an honest review. 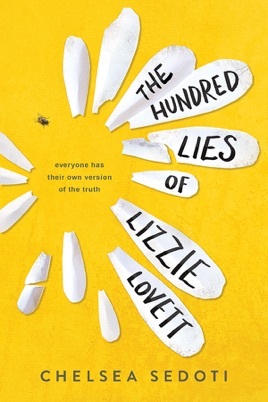 When I first received my ARC of The Hundred Lies of Lizzie Lovett by Chelsea Sedoti, I was very excited because I had heard so many great things from other bloggers about it. It took me quite a few chapters to really get into this book. Twelve chapters to be exact. It wasn't that the story was boring, but that Hawthorne Creely really got on my nerves. Hawthorne doesn't have too many friends, but then pushes the one friend she does have away by being rude and self-centered. She complains that she is always bored, but then never does anything but sit at home, even when she is invited out. Also, she is pretty terrible to her older brother Rush. He tries multiple times to reach out to her and be nice, because he clearly does care about her, but she is always rude and dismissive towards him all because he was a popular jock in high school. Hawthorne did redeem herself in my eyes towards the end of the book. She seemed to have matured and grown up. Although I probably won't read this book again and it isn't one of my favorites, it was a good story once I was able to get into it. The romantic in me wanted to see something happened between Hawthorne and Connor. Although, in a way I am happy that the book ended the way it did because it focused on the personal growth of Hawthorne.